Birds are chirping, it's light out when I get home from work, and my face doesn't hurt when I walk outside. It must be spring! I'm ready for all the farmers markets and fresh eating and doing it all without bundling up in 12 layers. Asparagus is one of the greatest finds at the early spring markets and the best way to upgrade it is with plenty of cheese. It's like when your parents would smother your veggies with cheese to trick you into eating them except it's fancy melty fontina cheese and you're eating the asparagus on purpose. It's even better in a buttery, flaky pie crust as a quiche you can eat for breakfast, lunch, or dinner. Oh, and some crispy pancetta doesn't hurt either. As always, the pork comes first. Here, it's pancetta instead of bacon just to elevate the dish a bit, but bacon would work just as well. You just have to cook it off until it's crispy. I use the pork fat to cook off a bit of garlic, too. 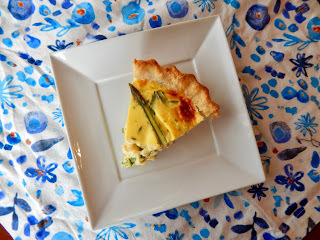 The asparagus is a little more tricky; you need to blanch it and shave it so you get those gorgeous ribbons running through the quiche. Blanching sounds more challenging than it really is but it's definitely worth the effort. You just boil the asparagus for a minute or two in salted water then transfer it to an ice bath to stop the cooking process. After that, snap off the tough ends and shave with a vegetable peeler or mandolin. I've tried slicing it with a knife but it's way easier to get thin, even strips with a peeler. 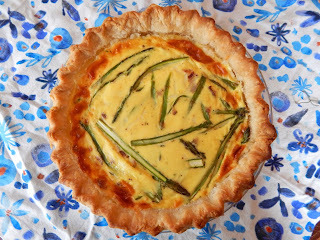 The quiche base consists of a few eggs and some half and half. 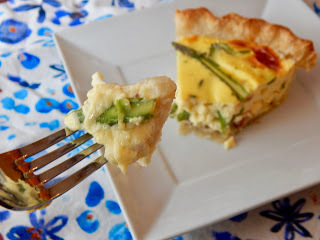 Compared to most quiche recipes loaded with cream, this one really isn't that bad for you. Well, until you stir in all the pancetta and cheese. 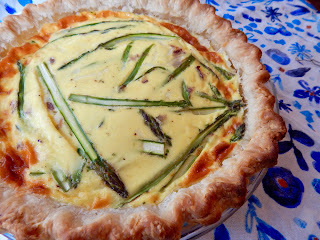 You can stir in the asparagus here and it will mostly float to the top or you can toss in as much as you want once it's transferred to the pie crust. The crust can be a classic homemade butter crust, you can throw some cheese into the crust for some extra flavor, or you can make things faster by just using a store-bought one, even though it won't be nearly as good. 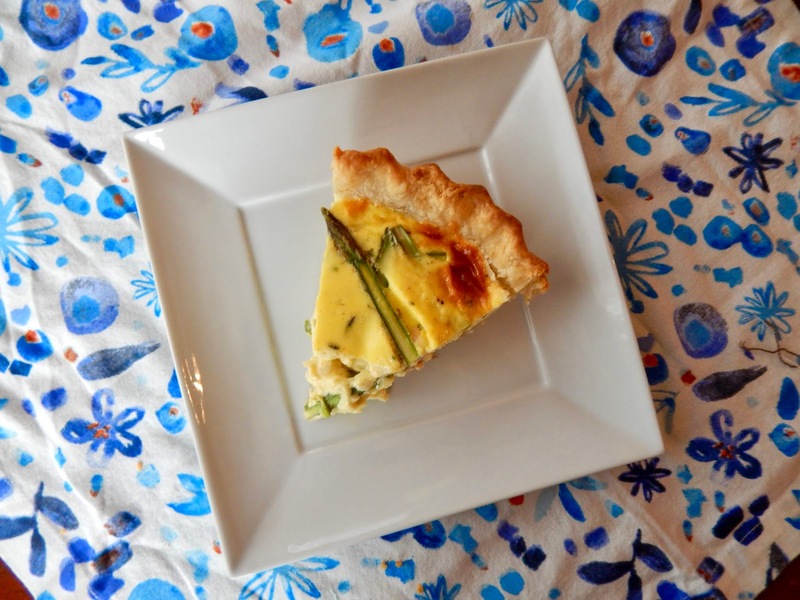 The great thing about quiche is that you can eat it whenever you want. It's eggs, so it works for breakfast, or you can serve it with a salad to bulk it up for lunch or dinner. You can also grab a slice cold from the fridge if you need a midnight snack. If asparagus isn't your thing (or this just gets you in a quiche-y mood), you can also try out some with mushrooms and caramelized onions or a classic quiche Lorraine. Press the pie dough into a greased 9" pie plate and chill until firm. Heat a large skillet over medium heat. Cook the pancetta until crispy. Add 2 cloves garlic and cook for 1 minute or until fragrant. Set aside to cool. Bring a large pot of salted water to a boil. Blanch the asparagus for 90 seconds then transfer to an ice bath. When cool, trim the ends and shave with a vegetable peeler or mandolin. Whisk the eggs and half and half together. Add the fontina, pancetta, and asparagus. Season with salt and pepper. Pour into the crust and bake for 40-45 minutes or until golden and set, covering the crust as necessary to prevent over-browning. Pulse 1 1/4 cups flour, 1 1/2 tsp sugar, and 1/2 tsp salt in the bowl of a food processor to combine. Add 1 stick of chilled and cubed butter (and 1/2 cup shredded hard cheese, if desired) and pulse until small lumps remain, then drizzle in cold water until it clumps together.